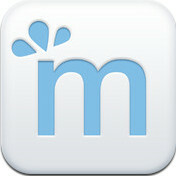 Minutely (iPhone/iPad) - Excellent crowd-sourced weather app ~ Android Forever! Developer Quote: "Minutely is the completely new app from the team at Ourcast." No matter how good weather forecasters may be at their profession, they can't be everywhere. And they aren't where you are or you'd see them standing there. So why not get your weather made even more accurate by using crowdsourcing? That's what this app does. You and your millions of fellow Minutely users (I don't really know how many there are) can make corrections and add minutely (get it?) updates. Minutely is the first App to combine the power of crowdsourced data (allowing anyone to contribute to our unique weather forecasting model right from their phone) with traditional weather forecasting data. The result is an incredibly accurate short-term, hyper-local weather forecast - down to the minute. And it lets you get some of that frustration out when the weather man gets it wrong! Minutely also provides the worlds first real time 3D Radar right on your phone. Understand the true size of whats coming towards you with never before seen volumetric data. You wont find us massaging the data with our pretty animations. 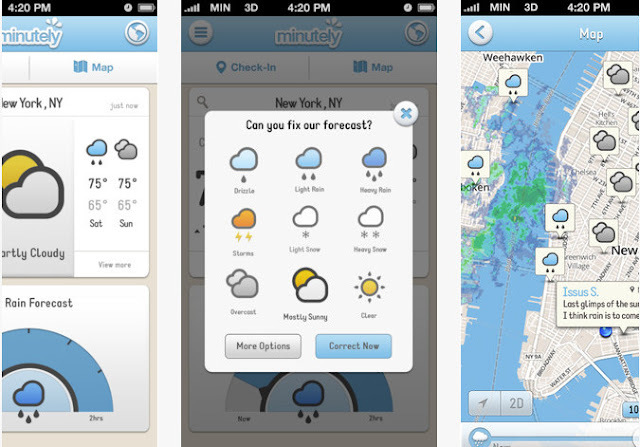 Minutely is a full featured weather app that gives you all the information you will need to make the right decisions when planning your day. Going for a run? Riding to work? Or Just want to know how hot its going to get and when. Check Minutely and plan your outdoor activities with confidence. - Hyper-local 2 hour weather forecasts covering anywhere in the continental USA down the the minute. - Night mode with moon-phase animation based on your location. - Current temperature reading with high / low for the day. - 24 hour temperature with chance of rain graph. - Sun rise and sun set times. - Report your own weather conditions right on the app’s home screen, making forecasts more accurate for everyone. - See your own reports and others around you. - Share your weather conditions easily on Facebook and Twitter.